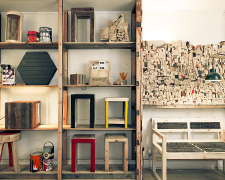 East London Furniture make furniture from 100% recycled materials. All products are made in our central London workshop. Going beyond the normal reclaimed timber yards, all materials used are salvaged from waste, meaning that most materials used in the products have been diverted from landfill. East London Furniture is supported by Crisis.